Mum: So, what do we do with it?? PY: Err... it still taste good, can we just keep it? Mum: So, what do we do with it?!! PY: ... I ... don't know! Mum: We have to get rid of all evidences. Mum promptly scooped said turd into a plastic bag and binned the offending 'evidence' while I quickly washed up the used dishes, whisk and pot. By the time Dad came home from work, the utensils have been stashed away and the waste bin empty. It was as if nothing happened after dinner. The above scene happened more than once. This, ladies and gentlemen, was how my mother and I began the journey of kaya making more than 20 years ago, while I was still in school. My late father loved the stuff. In between his slices of bread or toast, he could do without butter or margarine, but at least half an inch of kaya had better be there. And it better be sweet. As always, Dad liked to make his own thing if he could. He started the whole homemade kaya business but failed on the first attempt. After that, Mum and I got interested. And we were quickly schooled by this finicky, labor intensive, mother of all egg custard hell. It took a few tries before one night, we finally got the product we were looking for. Golden orange, smooth and shiny kaya after about four hours of taking turns to baby sit the pot by the stove, managing a wooden spoon with one hand and a woven bamboo fan with the other. We proudly bragged to Dad about it. Of course all the previous failed attempts remained top secret and Dad had no idea. He finished the entire container in less than a week and then started his try again, after obtaining 'tips' from us. From then on, Dad made his own kaya. Sometimes it was green, sometimes dark yellow, other times almost brown. He rarely got the golden orange Mum and I scored that one time. Sometimes it looked slightly curdled, other times really thick and smooth. I vaguely remembered a few batches which became watery after just one week, Dad must have taken a shortcut making those. Needless to say, Mum and I never made kaya since that one time success. We left Dad to it. I don't really fancy the stuff and we both find it too sweet. But last weekend I made a batch, using this recipe which I posted seven years ago, back when I was blogging personally. 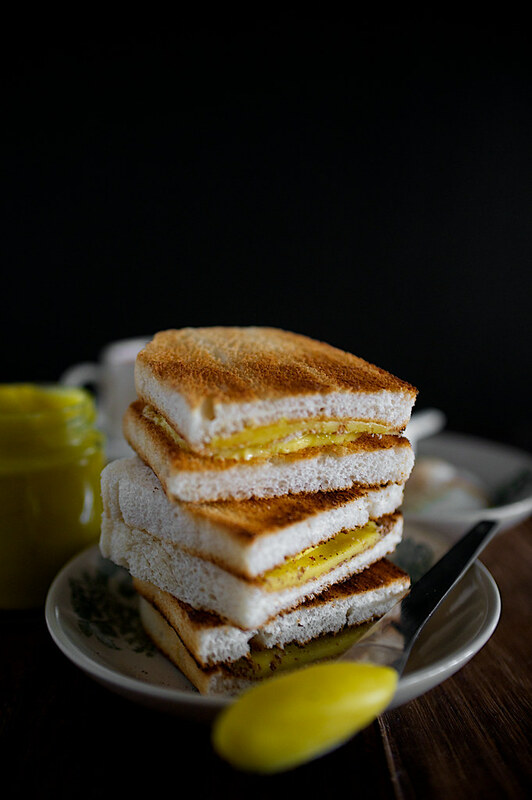 Vijay and I recently enjoyed kopitiam breakfasts at home, complete with soft boiled eggs, Punjabi bread toasts, hot Milo for me and coffee for him. I've been making the toasts with just butter, missing the essential sweet coconut egg jam between them. A sudden nostalgic moment hit me, remembering the 'adventures' my mother and I went through. So I stirred custard for 2 1/2 hours on a rainy Saturday afternoon. I didn't prepare well for it. I used supermarket eggs, with pale orange yolks. While my parents had a proper double boiler for the job, I used a makeshift one which was not good for this particular custard. The bottom pot was too small; hence the water was too hot even with the lowest heat I could manage. The top bowl was too big, with too many exposed areas not covered by steam from the bain-marie. My custard crystalized along the sides of the bowl. I could only cook the jam for so long before the first sign of curdling appeared after 2 hours. Then I panicked and quickly poured the whole thing into my blender. It ran for about 5 minutes before breaking down, complete with smoke coming out of the motor unit. The KitchenAid came to the final rescue, otherwise you will not hear of this and the above scene with my mother would've repeated itself, only this time with Vijay and my messed up head. After reading this, you will either be so taken in by the challenge to try this yourself or think that I'm completely mad to go through so much pain for two small jars of something which I'm not mad about so much anyway. Sure, the kaya was too sweet and not golden orange. Yes, I broke my blender in the process and almost went mental before saving the jam. But there is no regret. Every step of the way, I was reminded of Dad and his persistence in making his own kaya every couple of weeks. He passed away four years ago last week. This one is for you, Dad. 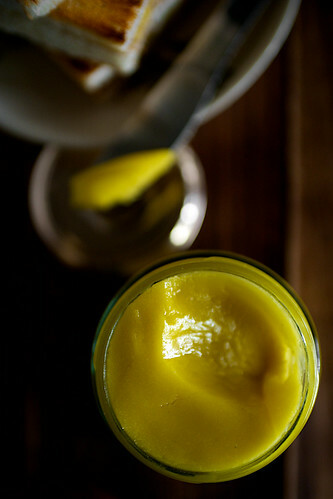 Note: To get the best final result - a smooth custard, always keep your beating and stirring in one direction only. Ensure the bain-marie is well setup and not too hot or the custard will split. If this happens, continue to cook till the mixture thickens, then cool it down and blend it till smooth. The success rates of homemade attempts are higher with freshly squeezed coconut milk. Bring the water in a double boiler/bain-marie to boil. Meanwhile, filter the coconut milk to remove impurities or shredded coconut bits. In the mixing bowl, whisk all the eggs slightly to break up the yolks. Add sugar by batches and whisk to dissolve. After the sugar has dissolved completely, add the coconut milk and whisk with all the strength you can muster till the mixture is smooth and well–combined. Once water comes to a boil, reduce heat till the water bubbles continuously, but is no longer boiling. Place the top pot on firmly and pour in the mixture. Include the knotted pandan leaves. Now comes the interesting part. For at least the next 2 hours, come hell or high water, you will have to continue stirring. Make sure to stir all the way to the bottom and sides of your pot. Keep stirring and don’t stop till the custard slowly thickens and finally sets into the consistency of what you will actually spread onto your toast. 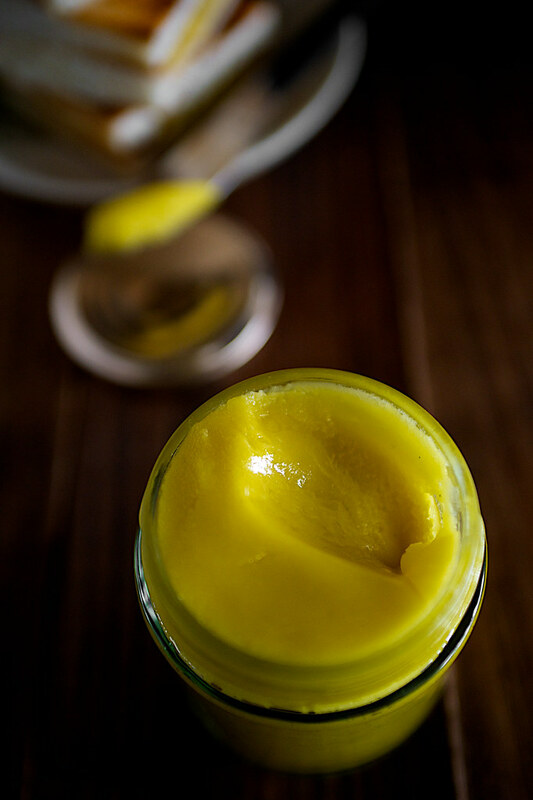 Depending on the freshness of the eggs (which affects the color of the yolks), the age of the pandan leaves and the caramelization of the sugar (how long you cook it); the color of the custard will slowly turn golden orange/brown or dark green. After this point, the time required to cook the kaya depends on how long you wish to store it. For maximum storage period of up to 4 weeks, cover the top pot and continue to cook the kaya over very low heat (water no longer need to bubble) for another hour or so. This is the best approach. Leave to cool before storing in an airtight plastic or glass container. Refrigerate accordingly. I am bookmarking this! 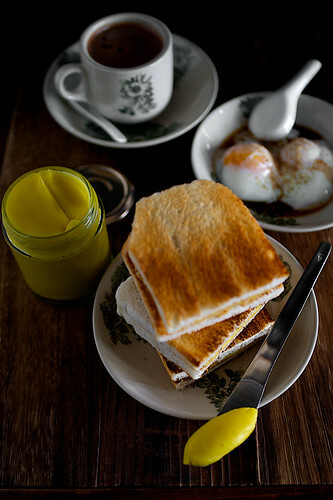 Kaya toast is also my father's favourite! Such a great story. I have to admit I was slightly onfused as it looks like English Mustard and thought you were slathering it on the bread a bit thick for that - it would blow your head off! I might try it some time, hopefully I'll be able to find some pandan leaves. Janine: To me kaya is not brown but golden orange. Brown ones indicates over caramelization of sugar in the custard. My father used to get our kaya from a kaya man at Petaling Street - his is golden orange all the time! Rosa: This is a kind of custard, but not curd since there's no acid in it. Although this color is very much like lemon curd! Pei Lin: Thank you dear! Lisa: Try making it again. Use a proper bain marie and very low heat, you will not have scrambled eggs. thelittleloaf: Thank you! I've wanted to make and talk about this for a very long time. Shirley: Remember to cut the sugar and increase the eggs! This will be definitely to sweet for you. inthebow: When you use whole eggs the whites cause it to thicken slower. Canned coconut milk is not recommended for the best results, unless you have no other choice. Shayma: Thank you dear, you're always so sweet! Becs: You should be able to find frozen ones where you are. Good luck! 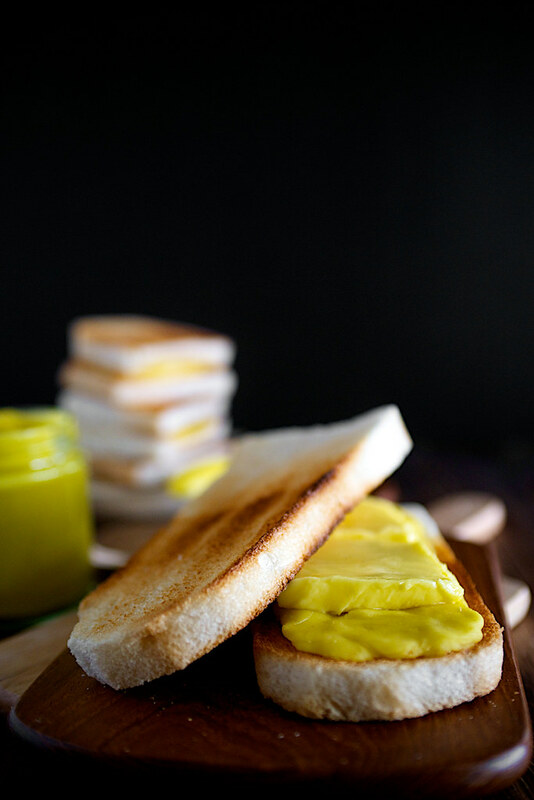 such a sweet story :) This sounds like a great condiments and love love your photos! kankana: Thank you for your sweet feedback! Anh: There's no need to convince yourself. I'm not a fan of it either. In fact, I didn't eat it much when my father made it. Mother and I prefered our toast savory, with just salted butter! I've been following your posts for a long time, and have always really appreciated the honesty and heart you put into every entry, especially this one. I grew up on the homemade kaya my father made (its impossible to find in the States), and will always remember his patience with my banging about in the kitchen while he laboriously stirred. It wasn't until five years after his passing that I learned he never cared for the stuff, and had always gone out of his way to make it for me. For years, the tall narrow jam jar had always been full and dutifully refilled, and the smooth, sweet kaya spread on crisp toast in a heart shape on my birthday without fail, into my high school years until he passed away. And never having known he had always done it for me! It's amazing to see that this love for family and the food we cook and eat with them is so universal, and so beautiful to see how their memories live on this way. This was an a great post, full of great memories. minhtii: Thank you for your heartfelt comment. My parents always cooked our meals with our favorites in mind too, although at the same time they were strict in ensuring we kids got a balanced diet. Food and memories, that's why we have stories to tell. i tried making kaya today (thurs 04april 2013). been thinking about making it and at last i did it. it took me 1 hour and 45mins in total to complete it. the colour is nice (caramel brown). i took out the pandan leaves while it was still liquid otherwise all the delis kaya would stick to them.what a waste would that be! the texture is NOT what i expected which is smooth, shiny and transparent like. mine is a bit curdy to my disappointment. i can smell the eggs.i hope the smell will be gone once it cools down. i think it might be a little too sweet. i will adjust the sweetness next try. my husband would be my judge. i am going to serve him toast for tea today. Sharni: If the mixture curdles (which is why it tastes like eggs, they're scrambled), then your double boiler may be too hot. You can reduce the sugar to your liking, it will affect the color slightly. 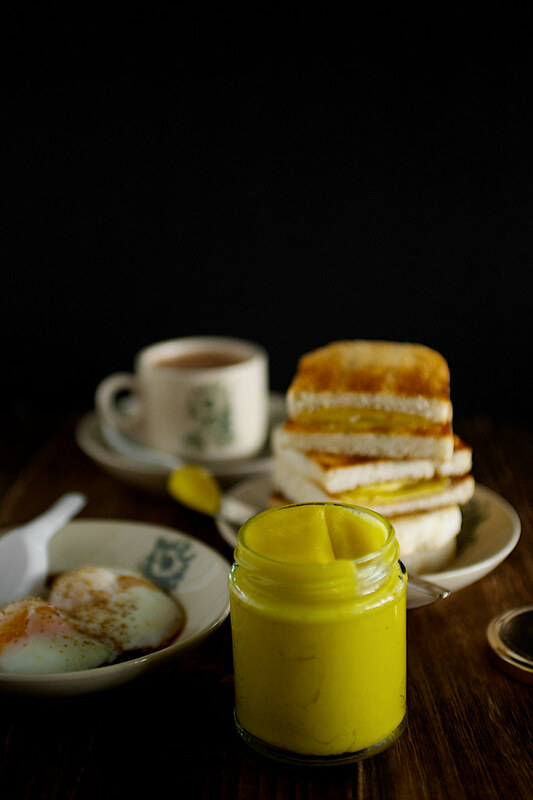 Why do we need to use egg yolks only? Kaya should be made with duck eggs, not chicken. Hence the darker colour.